If you need a quick and easy kid-friendly dinner idea, let this recipe and your pressure cooker lend you a hand! Best part? No store-bought sauce in this spaghetti means no preservatives or additives. 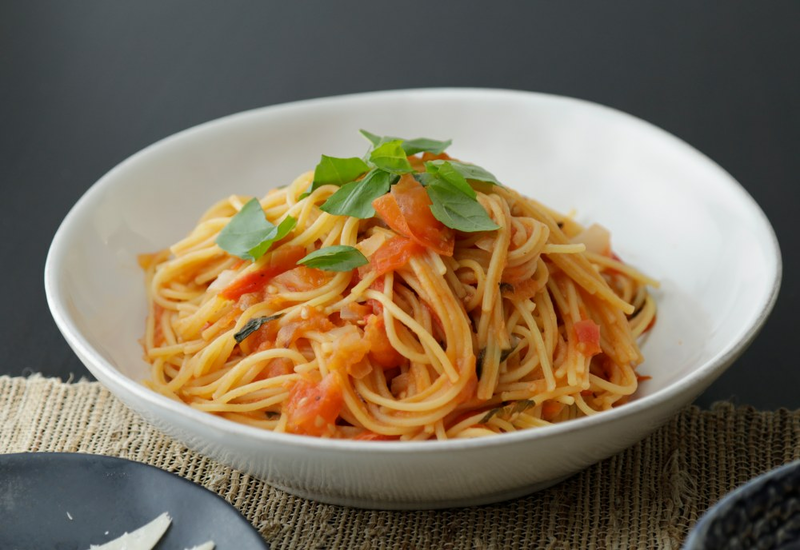 Fresh tomatoes, garlic, and basil make a tasty sauce for spaghetti in this one-pot wonder. The entire meal will be done in about the time it takes to boil spaghetti on the stovetop. Swap in vegetable stock and omit the cheese and you have a vegan dish! If you need more protein in your pasta dinner, make meatballs or grill sausages to serve on top of this. Get them started before you make the spaghetti, however, because the spaghetti will be done quickly and is best enjoyed immediately! Per Serving: 328 calories; 9g fat; 51.7g carbohydrates; 11g protein; 3mg cholesterol; 679mg sodium. Are spaghetti night is usually glass jar sauce and frozen pre-made meatballs. This recipe blew the family away. I added 1 diced green pepper to the mix. Next time I think I’ll add some mushrooms and sauté a little at the end. I’m looking forward to trying this again. This was so yummy! I added a pinch of sugar, but this is totally optional. I also stirred in fresh spinach at the end and let sit while on sauté until it wilted. The parmesan on top is a must, I used freshly grated parm instead of shaved, it was delicious. Good recipe, but I missed having traditional spaghetti sauce. Next time I will probably make a thicker sauce to cook the noodles in the pressure cooker. My favorite aspect of this dish was the garlic. You can never have too much, so I even added a little extra. I was a skeptic about making spaghetti in the pressure cooker. Normally I boil my noodles in salted water, drain, rinse, etc. This recipe requires none of the aforementioned, and it still turns out great. I added pre-cooked chicken slices to this spaghetti and it was delicious. I also subbed vine-ripened tomatoes for roma tomatoes. Worked like a charm. My Multipot is new to me and this was one of the first recipes I made and it is one of my new favorites. I used double the amount of garlic because we love garlic at our house. I also used "thin" spaghetti because that is what I had and it cooked perfect. I feel the richness of the chicken stock made this better than any pasta dish I have ever made. I highly recommend this for pasta lovers. My kids hate tomatoes, so they were not fans of this recipe, however, I loved it. Especially topped with shaved parmesan and basil. Serve it with delicious garlic bread for a tasty weeknight dinner. This is definitely a one pot wonder! It only takes 10 minutes to cook (5 mins + 5 mins natural release). Comes out perfect every time. Delicious, vegetarian, and easy to make! I just made this in my instant pot as I am waiting on my Mealthy Pot to arrive, I made half the recipe, I added extra garlic and extra onion and they shopped the tomatoes fine in my food processor, this was absolutely delicious! My husband & I enjoyed this recipe very much. To have the noodles aldente, should I quick release a minute sooner? I added more garlic (because I LOVE garlic). This meal was SO FLAVORFUL. The family all wanted seconds! I sauteed ground bison before adding olive oil and garlic and subbed in chopped San Marzano tomatoes and a veggie pasta. So easy, fast, and DELICIOUS!!! Wow! Delicious! I used halved cherry tomatoes and this was such a delicious simple dinner with tons of flavor! You guys have the best recipes!!!! You know it’s a winner when your Italian husband and teenage daughter both give it a thumbs-up! Quick, easy, and delicious, and much healthier than what you’d get from jarred sauce. We used rigatoni instead of spaghetti - simply added 2 minutes to the Pressure Cook time and ended up with perfect al dente pasta. Very, very good meal. It got me a bit worried when I took off the lid and a lot of the pasta was stuck together. But by using a couple of forks to separate them, they came out fine. I thought for sure the pasta would be hard, but it was perfect. This recipe is absolutely unbelievable and so easy. Basically followed the recipe, but used a can of no salt added Hunts diced tomatoes and just 1 cup of chicken stock. I also went a little heavy on the garlic because garlic is never a bad thing, and added a few extra basil leaves in the pot on top of the julienned ones I mixed it, but left the whole one just right on top. Words cannot describe how good, light and fresh this tasted when done. I expected to have enough for at least 1 day of leftovers but it was so good, the whole thing was gone within 20 mins between 2 people. As a base line, what size canned tomatoes would equal 10 whole tomatoes? OR How many cups would =10 whole tomatoes? Thank you!